Next: The best, most moist, & delicious Chocolate Cake. Ever. Previous: Chocolate & Pretzels & Peanut Butter & Oreos & MORE! Oatmeal Peanut Butter Cookies, this time made with mini peanut butter cups from Trader Joe’s, semisweet chocolate chips, and milk chocolate chips. 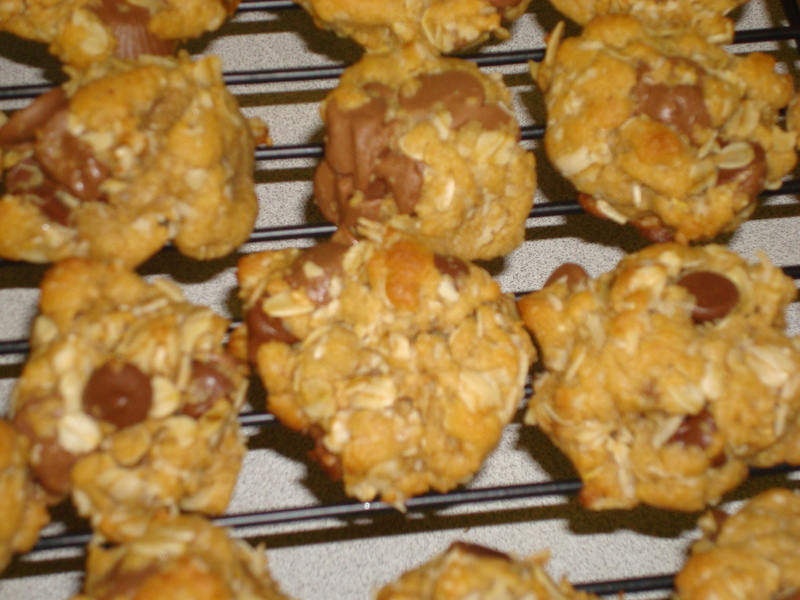 They are made with all oatmeal (no flour) and lots of creamy peanut butter! For some reason, the dough did not come out the same as it has in the past. I’m thinking the reason is because I used Old Fashioned Oats, rather than quick oats. The dough ended up a little crumbly, so I made a few batches of cookies, and then put the remaining batter into a large jellyroll pan to make bar cookies! The result? Peanut buttery-chocolatey- oaty deliciousness! Try them out yourself! If you like chocolate & peanut butter, this is a treat you will LOVE!! Preheat oven to 350 degrees F. Beat the peanut butter, butter, and sugars in a large bowl until creamy. Add in the eggs, vanilla, salt, and baking soda. Beat until well combined. Add in the oatmeal and chocolate. You will probably need to switch to a wooden spoon, as the batter will be thick. Scoop by tablespoonfuls onto parchment-lined baking sheets. Bake in oven 8-10 minutes. Remove from the oven, cool for a few minutes on the pan, and then remove to a cooling rack. Enjoy warm (& gooey) or cool completely! These store well in the freezer if you want to freeze some too! 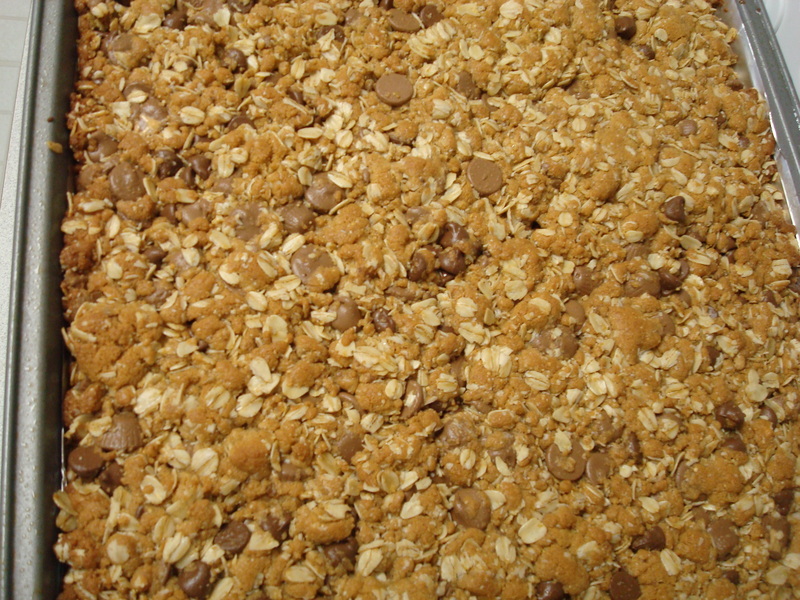 Peanut buttery, chocolatey goodness, coming your way!